Recently, I decided to reintroduce salmon into my diet because salmon is a rich source of omega-3 fatty acids. But, Tina finds that cooked salmon is usually very dense, chewy, and not very tasty. The easiest salmon recipe I know is simply to sprinkle lemon-pepper on salmon, optionally add some garlic slices, and bake at 350°F. Unfortunately, unless you enjoy the natural cooked flavors of salmon, this dish isn't that compelling. Lucky for me, the July & August 2004 issue of Cook's Illustrated magazine contained a quick recipe for Glazed Salmon. Not only is this recipe easy to make, it tastes excellent. First I took a large fillet of salmon and cut into pieces, each about 8 oz. (225 grams). 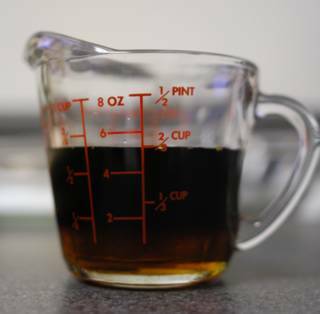 I measured out 1/3 cup soy sauce and 1/3 cup maple syrup. After mixing the soy sauce and maple syrup together, I poured it into a 9x13 in. pan. I placed the salmon filets flesh side down into the mixture. In my case, I had more salmon than could fit in a single pan, so I whipped up another batch of soy sauce and maple syrup for the extra pieces. I slipped these into the refrigerator while preparing the glaze. 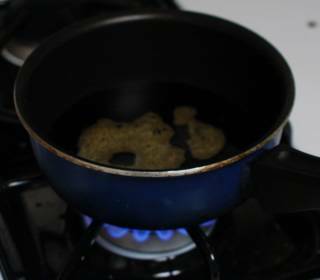 I then poured 2 tablespoons of soy sauce and a 1/4 cup of maple syrup into a small saucepan. I then brought it to a simmer and held it there for a couple minutes to thicken up into a glaze. I set aside two tablespoons for use later and took the rest outside to the grill (which I turned on). I took the salmon out of the refrigerator after it had been in there for fifteen minutes and liberally covered the flesh of the fillets with fresh ground black pepper. I took the salmon out to my preheated grill. After soaking a paper towel in some vegetable oil, I used a pair of tongs and rubbed the grill with oil to keep the fish from sticking. Then, I placed the salmon flesh side down on the grill over high heat for three minutes. I flipped the salmon over (still on high heat) and brushed some glaze over each piece (onto the exposed flesh). After two minutes (when the thickest part of the filet has been cooked about halfway through), I brushed more glaze onto the flesh and flipped them over onto the low heat side of the grill. The final judgment? Tina liked it - so it's a keeper. 1/3 cup soy sauce mix soak 15 min. What an excellent site this is. I'm an expat American living in Belgium and cooking is my hobby. Over here discussing things like the benefits of omega-3 and the horrible dangers of hydrogenated fat are normal, I did not think many in the States were aware of these things. I am very happy to see that you are spreading the word Mike. Nowadays people spend a fortune on schools for their children and still pump them full of trans fats. A simple step like upping the omega-3 and eliminating hydrogenated fats would add many IQ points on to your little loved ones brains. I too recently reintroduced salmon into my family's diet to increase our omega-3 intake. The problem with salmon is that the best type, wild salmon, is rare and expensive. The standard cultivated version is fed with pellets that contain dangerous chemicals. Luckily here in Belgium we now have organic cultivated salmon, which is much, much lower in pollutants. I think the best way to serve salmon is from a recipe in the pink Chez Pannise cookbook, grilled salmon with a tomato/basil vinaigrette sauce. I bet my children would like this glazed recipe that you have presented today Mike so I'm going to give it a try. BTW if you are interested, I can send over a translation of some simple recipes that are currently quite popular with home cooks in France and Belgium. You're welcome to post recipes in the forum for everyone to enjoy. I read the forum as well and sometimes bake or cook something that strikes me as interesting and convenient. And what is wrong with the natural flavour of cooked salmon?! Ok, so its not quite as good as Tuna, but its still pretty tasty. If I was grilling it like you did, I would do skin side first, and turn it just once. As a college student, I stare, mouth-watering, at these recipes. Is it possible for one to grill on low with a george forman? put two forman's next to each other, turn one on, and cook on the other...? Or should I just avoid grilling recipes that require any precision? 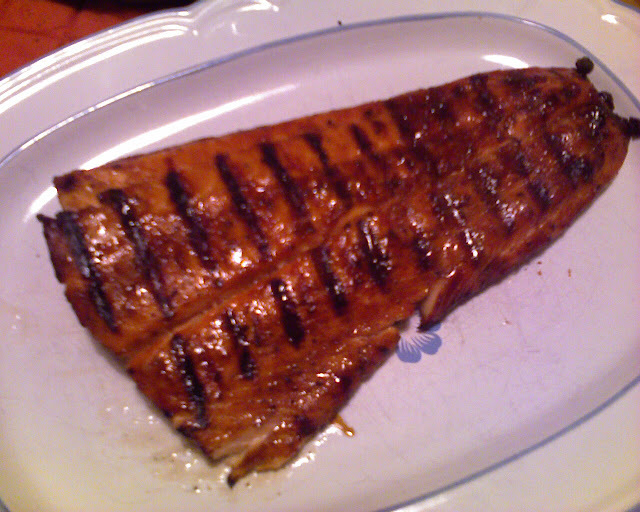 Since the George Foreman electric grill doesn't have high/low settings, I would grill the salmon on an open grill (or for half the time with the grill closed). You'll have to be real careful when watching the salmon to make sure it doesn't get overdone while you are finishing the cooking. The problem with constant high heat is that the outside gets fully cooked (and over cooked) before the insides are done. Low heat cooking allows a more even temperature rise within the food being cooked (especially for larger pieces of meat). My suggestion is to give it a try; the results should still be more than satisfactory. You're site is better than a betty crocker cookbook as far as directions and pictures go. Thanks for being excellent. i shall now have ideas for dinner other than Wendy's. Cool title for a blog :) This is certainly the place to come for cooking tips. Salmon is the best fish ever. But not baked! We are spoiled over here in NZ where our food tastes wonderful. Here's how salmon gets prepared in my house. - Once marinaded, fry the salmon in a non stick frying pan. Don't add oil. Remember to put extractor fan on as it can smell quite strong. - Serve with hot potatoes (we just boil the potatoes and serve with a touch of cheese dip). I like your site, but I'm wondering why your grid setup for explaining the ingredients and steps doesn't include time. I don't typically include time in the recipe summaries because it isn't too meaningful unless a specific temperature is specified (as in baking). Time isn't all that accurate of a means to convey how long to cook something since humidity, ambient temperature, and other factors will affect cooking time. Also, I leave it out to save space in the summary. For this specific recipe, it's more important to grill the flesh and skin to form a crust than for any specific time. Hope it's not too inconvenient that it's been left out, but hopefully you read the whole article and the summary is there to remind you to do certain steps - not to replace the article. Thanks for the recipe, I'll try it. Salmon is good for you, but just FYI - Farm-raised salmon does not have the Omega 3 fatty acids because it gets those from the micro-organisms it feeds on in the wild. I love salmon. We buy it frozen in individual portions and then we microwave it for 3- 4 minutes for a very quick meal with some minute brown rice. Can I use honey instead of maple syrup?Because i sometimes use honey to glaze my 5 spice roast chicken. No, honey would not taste weird. The substitution for honey can be made one for one with maple syrup. Just go ahead and use 1/3 cup honey instead of 1/3 cup maple syrup and 1/4 cup honey in the glaze instead of the 1/4 cup maple syrup. Should taste great! As an Oregonian, I'd say the best way to eat fish is to dock the boat and fire up the grill. If you must add anything to the fish, sprinkle with fresh garlic salt. Not sure how to do that? Take the skin off a clove of garlic, place it on a pile of kosher salt and smush it with the flat blade of a knife. Mince the garlic on top of the salt. The fresh garlic juices will be caught in the salt and will intensify the flavor. Spread it on the fish and grill. Voila. Good lord! The only reason you have "dense, chewy, and not very tasty" salmon is because you're over-cooking it! When learning to pan fry it you should use a fork to pull back some of the meat in the middle. Most of the meat should look opaque pink, but the middle should be just a little bit translucent and raw looking. It's done! Take if off now! Quick! You want to remove it from the heat BEFORE it's totally cooked. The meat will continue to cook after you remove it from the heat. ... The salmon is safe to eat undercooked (like most fresh fish), so if you take it off much too early then don't worry, it will still taste great. At any rate it is much better undercooked than overcooked. ... If you do overcook your salmon the best thing to do with it is to let it cool in the fridge overnight then make sandwiches out of it - chop it up and add mayo. It's good in a soft roll. I just made this dish, and it was excellent. However I made a few changes to it. 1) Added a little bit of lemon into the Maple Syrup / Soy mix, I thought the acidity would help it marinade better. I'm not sure if it did help, but it tasted fine. 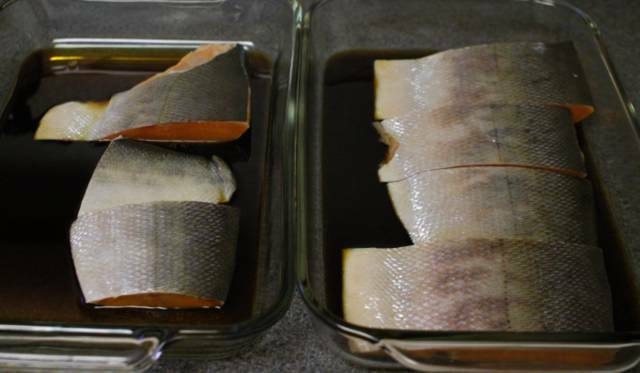 2) After I put the fish on the BBQ, I used the Maple Syrup / Soy mix the fish had been dunked in, and boiled off some excess liquid. When I flipped the fish over, I used some of this to glaze the sides, and when the fish was cooked, I used the remaining (fairly thick) mix to glaze the meal on plates. This made it taste like candy, maybe next time I'll cut back on the maple syrup if I intend to do the glaze again. GREAT RECIPE. I used a lite soy sauce instead. I also marinated the fish for 5 days in an air tight seal-a-meal tpye bag. Grilled for a few minutes on both sides, till heated through. The heat caramelized the maple syrup. Fish had a baked ham taste. What a way to eat salmon. I tried this recipe tonight and it was great. Thanks for the clear directions. Want to know how this Oregonian does it? Take a skin-on salmon fillet (I get about 1.3 lbs for my 4-person family). Use tweezers or needle nose pliars to pull out the pin bones. Place on a piece of foil slightly larger than the piece of salmon. Crimp the edges of the foil up slightly to retain some of the salmon fat as it cooks (makes the edge of the salmon taste wonderful). Using a sharp flat edge (not serrated) knife, eyeball the serving pieces you want to end up with after cooking and slice the raw salmon into serving size pieces. Slice down to (or almost down to) the skin. Not all the way through. I do this at an angle for better presentation - also, if you slice after the fish is cooked it makes the slices look torn. Place the foil and salmon foil side down directly over hot coals on an outdoor grill. Brush with marinade again, and cover with vents open. Check the salmon every couple of minutes, brushing liberally with marinade until done. Depending on the size of the fish, it's thickness, and the heat of your grill, total cooking time on the grill will range from 10 to 20 minutes. I take a metal fork that I use to pierce the thickest part of the salmon and then touch it immediately to my lower lip. If the tine of the fork is warm (meaning the center of the salmon is warm) take it off the grill (I use a wooden pizza peel to take it off). The salmon will continue to cook slightly under residual heat until it's served. I place the salmon and its foil on a cutting board (or a stack of old newspapers) use a spatula to lift the salmon off the foil/skin, and place it on the plates. It comes off easily after it's cooked. This is a terrific recipe that yield delicious salmon attractive enough to serve the most discriminating diner. It's easy, and because there is no turning, you have almost zero chance of disaster. 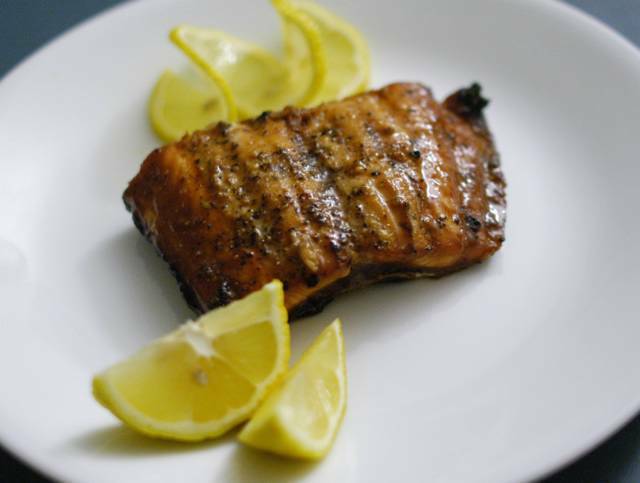 This is best with wild salmon, because the natural fat content yields a truly delectable piece of grilled fish. I tried this recipe when I ran across it last falls and mentioned it to one of my cooking buddies who said "Oh, teriaki sauce made with maple syrup." I found that I needed more maple syrup ot the flavor got lost--but that may just be my local syrup maker. Note that salmon is high in omega-3 but that it is also a predator, and thus concentrates heavy metals and other pollutants in the sea. Wild is better than fish farmed, probably because a major element in fish food is offal of fish processing--which concentrates things one more step. Fish farming as done in southasia where it is integrated with rice and duck culture does not have the same problem. The salmon was great! Followed the directions to a T. Made the best dam fish ever. You are right! Its a keeper! this is a great recipe. I've used it several times now and got compliments all around. probably the best dish i've made. thx! my wife puts orange slices, orange juice (? ), black pepper, butter, and garlic, on top of salmon, all wrapped up in foil like a hobo, and cooks it in the oven, it comes out pretty good. not sure if she put sugar or orange juice the first time she tried it, to counteract the orange slices; sometimes the cooked oranges are a little bitter. I stumbled upon this recipe through a search engine and decided to try it tonight. It was wonderful! Thanks so much! Subject: Saw this recipe on TV. I saw this recipe on WLIW Create- the pepper. A public channel here in NY. After doing a search for it I ended up here and it refreshed my memory on how to do this. Have the steak marinating now, but will it be ok if I use a cross cut section and pan fry it instead? Absolutely, no doubt about it. When I buy fish, I want what's freshest. I ask what was just put out and that's what I buy. It almost doesn't matter to me what kind of fish it is. I made this recipe this weekend and it went over really well. I initially picked it because of the simplicity (it was a party after all, I didn't want to spend the whole time cooking) and because it looked interesting. I did have to up the quantity by a fair amount for the glaze though because maybe I was spreading it on too thick but I didn't have nearly enough. I about doubled it I think. I had several people ask me for the recipe though so like you said, this one's a keeper. This is a great recipe for winning over people afraid of fish. Today we know there are great benefits to consuming fish like Salmon because it's an excellent source of Omega-3 fatty acids. But if you really hate fish, you can also get your Omega-3s from flax seed or a suppliment. Ok, so we've got a nice hot grill here and we're going to go ahead and start some salmon fillets. I've already given it a scrub with a rag with some canola oil on it, and I'm going to go ahead and give it a quick spray with some grill spray here. Be careful not to hold the can too close to the flame here. I'm going to start this salmon with the flesh side down first. I've seasoned that with a dry seasoning mixture of garlic salt and lemon pepper so I'm going to get some good lines on this guy. Then we're going to flip him on the skin side. Once the flesh side is showing up, I've got a butter mixture over here that's got some beer butter and onions and garlic salt in it so I can brush that fish down throughout the cooking process. If you notice, I've got these dials cranked just above the off position. I don't want a really intense heat for this fish, but it's hot enough to cook on. So now we'll shut the lid here and get some of that good smoke kickin'. Folks, help me out here. I've been looking over recipes for grilled salmon. 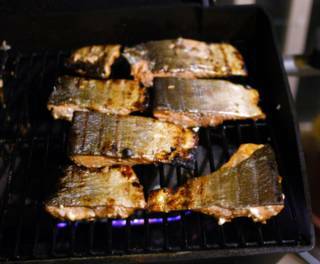 Some recipes ask you to remove the skin from the fish and others tell you to grill with the skin intact. What's the difference? Does it change the taste or texture of the flesh? For me, I'd just as soon leave the skin on. The last time I tried to remove the skin from my salmon fillets, I kind of tore the fillets up (I'm kind of goofy.) What are your thoughts on this. Thanks. I keep the skins on. They help keep the salmon together on the grill (especially if you don't pay attention and overcook them so they become flaky). Also, if done properly the skin can be a crispy treat. Want to know how this Texan does it? NO?! Well, we mostly have catfish here in Fort Worth, but I've found a good place for fresh salmon (the grocery store). I've had salmon most everywhere, even at fine restaurants in the Northwest, but the best I've had (with a single exception) was an afterthought, when I was smoking brisket and ribs on my back porch. The smoker (with an offset oven, no direct heat) was precisely at 250 degrees F, had been there for hours (so there's wasn't much smoke from newly added wood), when I added 2 large fillets on a rack above the briskets. I smoked them for about an hour, then served immediately after removing from the oven. What a great site! Thank you so much for all the great recipes. I've always used the rule of thumb that cooking fish usually takes 10 minutes per inch thickness. Has always workded for me. Place the filets in a zip lock bag and add the marinade. Marinade no longer than 1/2 hour. Pre heat grill on high. 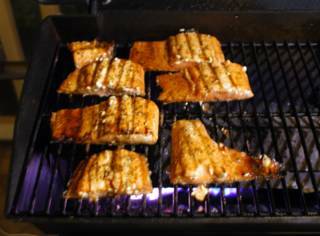 (Our grill is a three burner )Place fish rack on grill and add salmon. Turn grill to medium/off/medium and close lid. Grill 5 minutes, turn salmon over and baste with remaining marinade. Close lid and cook 5 more minutes. If you don't have a grill, this recipe also works well in the broiler. In a separate dish, melt 2 TBS of butter. Add 2 TBS of fresh lemon juice and mix. Pour over salmon filets once slightly cooled. Lay whole bay leaves (approximately 2 - 3 per filet) on top. Bake in oven 15 - 20 minutes. Don't over cook. I'm not sure what the white stuff is - most people call it fat, but I'm not sure if it is. Seems like it's closer to a protein. In any case, this is normal - but usually only happens when salmon is fully cooked (which in my book means it's over cooked). It's completely edible. Hi i just have a quick question. How many days is left over Salmon good for?? Once it's been cooked, it should keep in the refrigerator for about 3 days. A day or two longer if you overcook the salmon. I'm surprised nobody mentioned simply cooking it with olive oil instead of a marinade or glaze. Just rub the oil all over the salmon and bake, grill, or fry. If you use oil that already has dried herbs in it (you can find them at most specialty cooking shops, Pier 1 Imports, and even Marshall's) or make your own - just put olive oil and fresh dried herbs into a bottle and let them marinate together for a few days. I had salmon last night with a garlic & rosemary olive oil on it and a little sea salt - it was awesome. Excellent and so easy! I have spent hours on other salmon recipes that weren't nearly as good. Cooked this recipe up this evening and it was a *huge* hit! I had a vegan guest in the group, so I also cooked the same recipe with some sliced tofu and *that* was the true winner of the evening. I love the salmon marinade and sauce. It does give an unuual flavor. And, I have made it a few times, just for something different. However, I read through most of the comments and there was something missing! My hubby has passed away, but he would have an absolute cow if he saw the recipes, directions and pictures without associated and exact (+/-) within a few nanoseconds, the drawings to tell you exactly where to place the meat!!! I just had to throw that in. Told you, I was married to an engineer! Have made this recipe twice. Once for my family and again for my family and a guest. I knew this was a great recipe, but to see/hear the compliments from the guest was very rewarding. Thanks for posting such a nice and easy way to prepare salmon. Just so you know, I had salmon prepared this way at Bonefish restaurant. Ever since I tasted the flavor, I was on a hunt to recreate the taste. This recipe is the exact flavor I had at Bonefish. I'm a picky foodie, and my wife & I cook a lot (especially on our charcoal grill). This recipe rocks the block because of it's simplicity, and the results it produces. Thank God someone besides me finds most recipes unnecessarily terse! Try adding a peeled and finely chopped three inch segment of ginger root to the marinade. Let it soak in for an hour longer than the suggested marinade time and grill as indicated in the recipe. I'm glad i found your site. I was looking for specifically this kind of receipt and here it is simple and easy. the grid at the end was awsome! hahah, i loved it. Well tonight i'm firering up the grill and will cook the salmon just as your written. Wish me luck! what kind of maple syrup are you using? 100% or just regular store bought. I used 100% maple syrup bought from a store. Be careful when buying maple syrup as many of the "popular" brands are simply maple flavored high fructose corn syrup. Omega-3 fatty acids are pretty well known in America. Guess where the guy who discovered their benefits is fom. The receipe for glazed salmon did not say how long to marinate the salmon in the refrigerator or did I miss it? Sorry about that. Fifteen minutes works well for me. You can go a little longer - 30 minutes, but much more and I feel that it detracts from the texture. Thanks much. I'm not much of a cook but tried it and it liked it. This looks tasty! We don't have salmon here in the Caribbean, but we'll try it on the next fish we catch when we go sailing next time! Probably between St. Martin & St. Barths. Subject: after cooking the vegitables shall we keep in fridge? after cooking the vegitables. (in gravey stage) shall we keep it in fridge? and shall we take it for 3 day? there is any problem? Subject: Re: after cooking the vegitables shall we keep in fridge? Did you post to the wrong article? What vegetables? I'm going to give it a try as spelled out here, but have you ever marinated it for more than 15 minutes (like overnight) with success? I'm wondering how the flavors would be. Thanks. When I marinated much longer (an hour or more) I found the salmon was way too mushy. I really didn't like the texture. For me, salmon is a pretty finicky meat - cook it too long and it's no good, too mushy and it's no good, unfresh and it's no good... but when you get it right - it's awesome. Marinade: 1/4 cup soy sauce, 2 Tbs lemon juice, 2 crushed garlic gloves, 2 tsps sugar. I use a ziplock bag. Marinate salmon no more than 30 minutes. Remove from marinade (discard marinade) and place on double thickness paper towel skin side down. Blot top with paper towel. Generously crack pepper on top. Let stand for a few minutes (I'm convinced this gives it a good crust). Since I'm too lazy to fire up the grill, I usually preheat a good ol' cast iron pan and when its hot, put in a bit of olive oil. 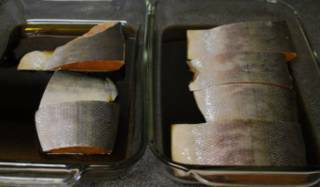 I cook the salmon starting skin side down, for five minutes (or less depending on thickness) each side. This is a foolproof and really, really, really good recipe! I serve it with a salad made with greens, crumbled goat cheese, toasted pecans and dried cranberries with a homemade honey mustard vinagrette (also simple, foolproof and delicious). I recently made this recipe and it turned out great. I'm definitely not usually a fan of normal baked fish, especially salmon, but I'm glad I tried this recipe. The glaze really gave it a nice flavor, much nicer, in my opinion, than that of plain salmon. Also, the flavor wasn't overbearing. Just to note, I baked it in the oven(rather than grilling it), and it came out fine. I'd love to try this again when I have access to a grill. My husband found this site and used this recipe to suprise me with grilled Salmon. It was delicious. It was his first time grilling fish so he just used blackened seasoning to be on the safe side. It was so good I ate it for three days. Now that he is more adventurous, he is going to try this Soy-Maple glaze. I am excited. Thanks for turning him into a gourmet cook. As for the people that marinade the salmon in lemon this would effectively cook the salmon (with the acids). Subject: Can I cook this using electric grill? I live in an apartment, so indoor gas grill is a no no. Can I try this on an electric grill? I just did something like this. I was more crude about it. Fired up the BBQ (medium heat) Put the (1 1/2" thick) salmon fillets on it. Sprinkled the exposed side with Kikkoman teriyaki sauce. Flipped them over after about 8 mins and did the other side the same way. Flipped them over one more time and poured about a tablespoon of maple syrup down the length of each fillet after sprinkling with ground black pepper. Cooked for about 2 mins more to let the maple syrup carmelize. It was good! Subject: Grilled Salmon is GREAT! Salmon is an excellent tasting fish. If overcooked however it will be dry and tough. If pan frying you dont need to add any oil as salmon supplies its own. Salmon is great for grilling as it usually can hold its form without coming apart. On a hot grill salmon should only take about 6 mins to cook. Thats about 3 1/2 - 4 mins on 1 side and an additional 2 mins or so on the flip side. Salmon works best with minimal seasoning. ALWAYS rince your salmon and dry THEN season with salt and pepper before cooking. My faforite pan frying method would be to add 2 fresh sage leaves on each sides of the salmon and nothing else. This method works well with grilling also, but you will want to mince the sage leaves and press said leaves onto the salmon steak/filet. When grilling or pan frying only flip ONCE. Flipping more than once can ruin the look of the steak/filet. If grilling always start on the best looking side of the salmon and put that side down on the gill to get nice looking grill marks. If desired, after about 2 mins rotate the salmon 90 degrees to get criss cross grill marks. Again, 6 mins is about all it should take to cook a salmon steak or filet. Try it, like it, eat it. Salmon goes great with roasted potato's, wild rice, mashed potato's, roasted tomatoes, asparagus, brussel sprouts, and many other wonderful veggies and starches. I've made this twice and it's the only time I've ever heard someone ask if there was more salmon. Truly great recipe. When watching the history of barbeque one lazy summer afternoon on the history channel, it mentioned that the original grills were piles of coal or wood that would be covered with damp edible leaves and herbs that would act as an easy clean up surface to cook the food on. 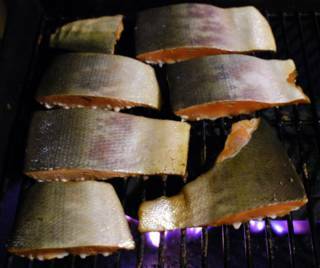 I also had access to a large amount of sage (a small bush growing in an herb garden) a charcoal grill and a large slab of salmon. After starting the coals I covered the surface of the grill with a thick layer of the herbs and threw some on the coals for good measure because I like smoked salmon. I then put the slab of salmon on the herbs whole, skin side down, and let it cook about 12 minutes (when it was cooked through on my fire). The easiest part was removing the fish from the grill because I could simply pick up the herbs with some tongs and everything lifted as a unit. The herbs got a little burnt but made an impressive presentation as a mat under the fish and nicely removed the skin (as it was stuck securely to the herbs) which although very nutritious isn't very tasty unless nicely crisped on a broiler. The flavor was wonderful and I've successfully repeated this method. Good luck! When I don't have access to a grill ... I've had great success using my George Forman to grill fish. 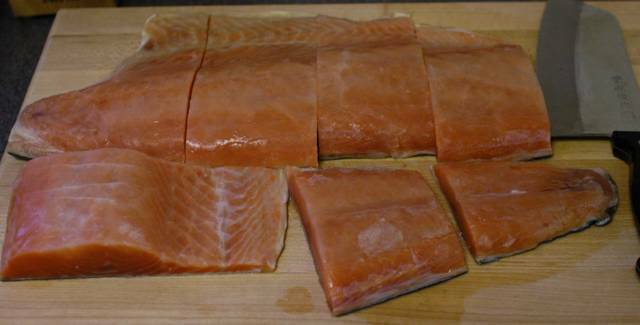 2) Take your FROZEN salmon, rinse under cold water to remove any ice. 3) Brush the FROZEN salmon with olive oil on both sides. 4) Place the FROZEN and oiled salmon on the hot George Forman grill and close the lid. 5) Cook for 7-10 minutes, turning as needed to ensure the sides get cooked. The FROZEN salmon ensures the fish stays moist during cooking, the olive oil creates a perfect crust. It's delicious! Also ... for the perfect Medium Rare steak on a George Forman grill, butter and season both sides of a THAWED steak ... place on a hot grill, close the lid and cook for 7 minutes. Here is a simple recipe that doesn't require a grill or even flipping, just a broiler. If salmon is in fridge, take out at least one hour prior to cooking and get as close to room temp as possible. Make sure filet is clean and dry. Set oven to broil and place baking sheet in oven or under broiler. Objective is to get the metal as hot as possible prior to placing salmon on it. Take 5 minutes to prepare the salmon while metal is heating. Place salmon skin side down on non-stick side of aluminum foil. Add salt and pepper immediately before cooking. Position the foil and fish so it is easy to slide onto the metal baking sheet (on a counter for example). DO NOT cover wrap fish with foil, merely use it as a "plate". This is the most tricky part of the recipe. Once the metal is as hot as possible, take out of oven and slide the foil with salmon onto it. Be very careful as the pan will burn you instantly. It should sizzle and start cooking right away. This is what you want. Place under broiler about 2-3 inches away from heating element. Leave broiler door/window open as you will be cooking with direct heat and you need to watch the fish cook. WATCH CAREFULLY. The filet will take no more than 10 minutes to cook, most likely less depending on size/thickness of filet. If anything, this step requires all your attention so as not to burn the fish. Once top of filet is browned, take out. Salmon will continue to cook as it cools. Drizzle with high quality olive oil and squeeze juice of lemon. Perfectly cooked salmon should be very moist and slightly pink at the center of the thickest part. This method will guarantee cooking through the filet from top and bottom with the timing based simply by the browning of the top of the filet. Spend the extra $ for quality salmon. Wild caught is best. Marinate as you like but it may interfere with the browning process. Bringing salmon as close to room temp as possible prior to placing in over is essential for predictable cooking. Herbs such as fresh chopped dill can be added when taken out of oven. Method will work for whole salmon filet or portions and other fish. Since my husband had a heart attack we eat a lot of fish and chicken. I take the skin off the salmon (I read this is where most of the contaminants are) and brown it top side down in a little margarine in a skillet. I then add about an inch of orange juice and a tablespoon or two of brown sugar. When cooked halfway through, I flip the salmon and finish cooking it. When done, I plate the salmon and reduce the orange juice and brown sugar to make a glaze which is then poured over the salmon. It can be served with segments of orange cooked in the glaze. I even had a friend suggest adding rum to the glaze. Delicious! Subject: Grilled is good, but if you have to wash the dishes anyway..
... try cooking the Salmon in the Dishwasher. Place the foil package in the top rack of the dishwasher. Load the dishwasher with dirty dishes and soap. Run the Regular wash cycle. When the Regular cycle is done, your dishes are clean and the Salmon is fully cooked. I've tried this twice and the Salmon came out perfectly delicious both times. The heat of washing and drying the dishes apparently steams the Salmon to perfection. Enjoy. about cooking the salmon over the dishwasher: !! i'm not sure if you're joking, but i'm really tempted to try that and see how it works out. i guess then its possible to cook it over any viable source of heat. like my old laptop. just want to know if anyone has ever used the hfcs maple flavoured syrup in this recipe and how it turned out. i like the real stuff myself, but its ridiculously expensive where i live. There are lots of references to cooking salmon until the appearance is opaque. Does anybody know what temperature this corresponds to? that's in the 130-140'F range. yup. that works - with the caveat you need a "drying cycle" - that boosts the dishwasher air temp to 'dry' the dishes. messy. there are easier ways . . .
the white stuff that oozes out of cooked salmon is not normal.....this indicates it is farmed!...this is the crud they feed and inject into the fish. wild cooked salmon has lines of whiter areas that are their fat..but it does not ooze out. white stuff from farmed salmon....UCK!...badbadbad...beware! It's a naturally occuring protein. I have a freezer full of wild alaskan salmon that does the same thing. I've noticed that it helps prevent these white globs if if I let the salmon warm up to room temp before cooking. I tried this earlier as part of an effort to introduce more variety in my family's dinner menu. It was a big hit and I'm looking forward to making this again.I was a little put off by the taste of the soy sauce, though. I'm thinking of going with teriyaki next time. Excellent recipe! I'm eating my first try of it now, and it's delicious! I was even using some cheap salmon fillets I found at wal-mart (I'm a college student), and it tastes amazing. I'll definitely be using it again. Thanks! gconnors, you are an idiot. How the heck do you know that if white stuff comes out it is farmed salmon? More white stuff comes out if the Salmon is very cold (like partially thawed) before cooking. I love your layout and I am an engineer, so I must love it for that reason. 1. There's a lot of different soy sauce brands and flavors, so if someone is put-off by a certain soy sauce, it's worth it to try another one. I am partial to the Maggi brand imported from France (German and US imports of the same brand are not even close). 2. No all Oregonians have boats. Nor do they want to tell everyone "I'm an Oregonian and this is how we eat salmon in Oregon." Personally I am from Oregon and I buy my salmon from Costco. 3. To the omega-3 comments: Omega 3 comes from many sources, and might be in farm fish was well. Salmon, and this recipe, are just delicious. Even if it made me rotund and sluggish, I would eat this. Yes, a huge difference. Any health food store should have some good options. I buy tamari (a type of Japanese soy sauce, usually fermented without wheat) when available. I just stumbled across this recipe as I was searching for a way to grill salmon. I grill a lot, but had never grilled fish and was unsure how to best go about it. I did not marinade the salmon, but I did prepare and (liberally) use the glaze. I also added about a tablespoon of lemon juice. WOW! The salmon turned out amazing! I grilled for myself and my girlfriend (who had said she "isn't crazy about salmon"), and she even said it was excellent. Hey, that looks like a great recipe I'll have to try it. Another addition to the recipe might be to add a little brown sugar to your glaze. Be careful it doesn't burn though but I'm sure you'd know that. Recently I've been doing fillets of salmon on the smoker with really nice results. I'm not going to lie to you - smoked salmon with cream cheese and crackers or cream cheese and a bagel is awsome. The recipe I followed is at Instructibles smoked salmon recipe. It turns out beautiful. Just another option to get those Omega's. Smoke salmon really taste great but the preparation is tedious. So, I usually bake salmon with lemon and dill. Recipes are all simple and preparation as well. Sounds like a wonderful recipe, I've had the salmon prepared this way at Bonefish Grill and I am excited to give this a whirl. As for the people that write comments putting down Salmon recipes and only want Salmon grilled as is, then why are you even searching this site, only to be a PITA is for sure. Get a life. thank you .it is so nice !